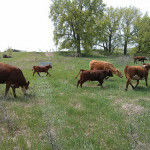 While we did manage to finally get the cows out on pasture in spite of the uncooperative weather, we still have quite a bit of fencing to do. You see, more fence = more grass. More grass = more cows. More cows = more beef. Anyway, so we’re building lots of fence lately. Mostly we’re going for the quick-and-dirty kind. 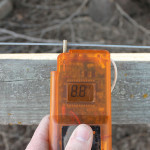 Fix up the old junky fences with a strand of hot electric wire. Just enough to get a few more acres available to the cows, as they go through an acre of grass pretty quickly. But the fence has finally reached across to the other property line, the one with no existing fence. 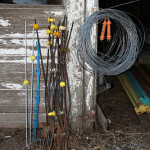 So we get to build some very spiffy new 4-wire fence. That’s pretty exciting stuff if you’re a farmer. 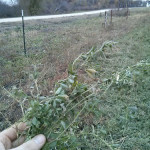 Being from Missouri originally, we decided to stick to the fencing methods recommended by the Missouri NRCS in their book Electric Fencing for Serious Graziers [PDF]. 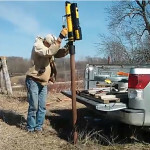 That means eschewing wooden posts in favor of posts made from used drill-pipe. 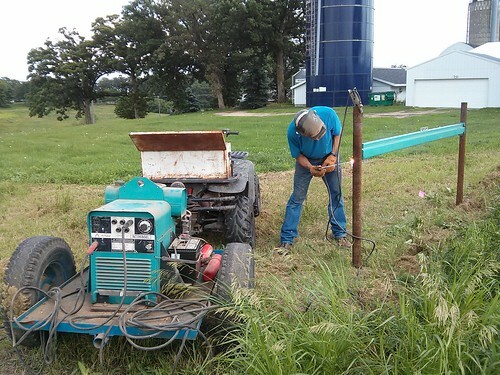 Drill pipe is wonderful stuff for fence posts. It’s cheap, it doesn’t rot and it’s tough as nails. If you use a suitable fence post driver, instead of digging a hole, then you can hang wire immediately. Heck, for 1 and 2 wire fence, you don’t even need to brace the cornerposts most of the time. But 4 wire fence? That’s gonna need some bracing. But how to attach a brace to a steel fence post? Oh yeah! 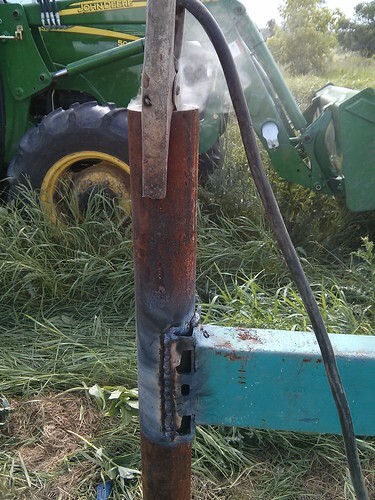 Welding in the field! 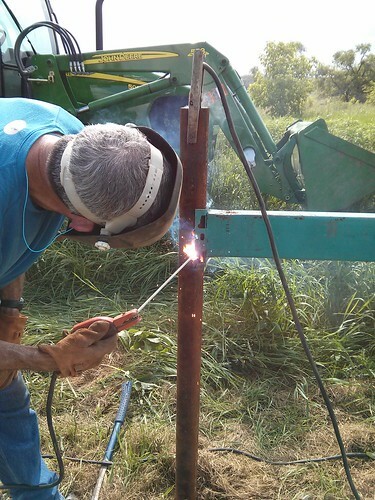 But wait, you say, how can one weld in the middle of a field? Simple, just find a lovely old “Air Products” welder/generator on Craigslist. If you can keep the gas line from clogging up with rust from the corroded metal gas-tank then it welds like a champ. Turns out that “Air products” is just a re-branded Miller welder, so you can get manuals, parts and everything (except the gas tank). We’re working on finding a new plastic tank, but so far we’re just dealing with the line getting clogged up every once in a while. So after cleaning out the fuel filter/sediment bowl a few times, the corners were all braced. Time to drive a few T-posts and hang some wire. Do you feel like Chicken tonight? Nice post Andrew this is great stuff for a rookie like me. where do you buy your used drill pipe? I’d ask around at the biggest well drilling outfits in your area. If you can get to somewhere that there is a bit of oil drilling, like the Dakotas, there ought to be quite a bit available there for cheap.